Have you ever seen a situation when a person is laughing and crying at the same time and you can’t tell if the person is being happy or sad? The reason why it’s confusing is because the smiling muscle and crying muscle are lying right next to each other in our faces! The muscle that pulls the corner of the mouth is called the Zygomaticus Major. This muscle is attached from the cheekbone, the Zygomatic bone, to the corner of the mouth. It contracts when we smile. It yanks the lips to the side, and creates a round hump on the cheek. On the other hand, the muscle that creates a sad face is called the Zygomaticus Minor. This muscle only contracts when we feel sad. Just like the smiling muscle, the Zygomaticus Minor is also attached from the cheekbone to the lips. It lies parallel to the medial side of the Zygomaticus Major. Therefore, happiness and sadness are right next to each other. Both of the muscles pull the corner of the lips to the side, and create humps on the cheeks. This is why it is very confusing to tell if a person is laughing or crying; or both. The feeling of sadness usually contains some kind of other feeling too, like anger, anxiety, or pain. Happiness is one of them. “Weeping of joy” is an action that happens when the happiness and sadness occur together at the same time. It may be hard to draw the facial expressions that exist between a very fine line like this. However, you will be able to recreate this complicated emotion on paper when you learn a few small tricks. The best time to see happiness and sadness occurring together is when people’s hearts are deeply touched. To get a realistic reaction, let’s look at some famous YouTube videos that show surprises and emotionally-charged reactions. This is a video of a man who receives joyful news of his daughter getting pregnant. Watch the change of his emotion from being surprised, thrilled, and touched throughout the video. We cannot see any negativity in his face even when he is tearing. The characteristic of this expression is his bright, glaring eyes that look hopeful and excited for the future. Let’s compare the expression of his pure, smiling face (Fig.1) with his “about-to-cry” face (Fig.2). The first recognizable difference is the triangle shape on his medial eyelid (A). The medial side of brows is pulled towards the center and upward (B). This is one of the main features that can be seen in the expression of sadness. 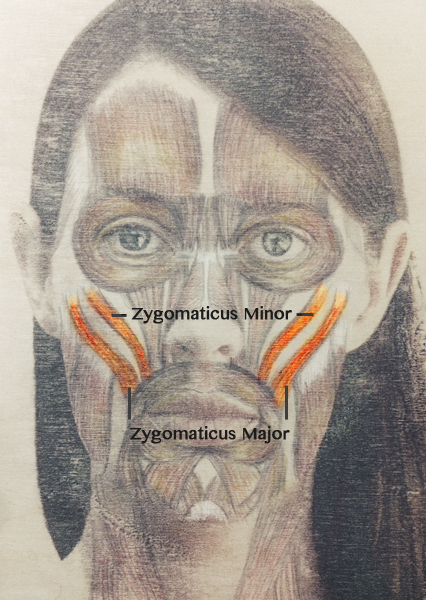 Also, we are able to see some differences between the contractions of the Zygomaticus Major and Minor. The smile that is created by the Zygomaticus Major has a smooth roundness on the cheek, and the Nasolabial Fold also creates natural curves. Although, when Zygomaticus Minor contracts, the Nasolabial Fold warps unnaturally, and the line looks like it is floating (C). 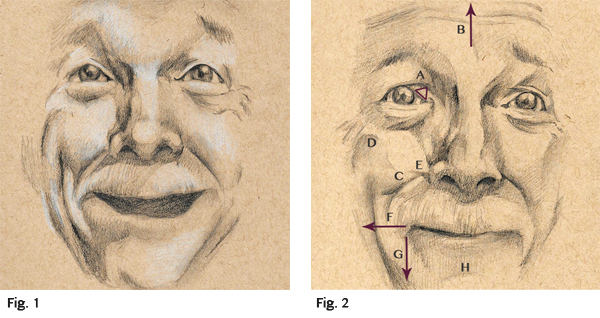 The skin of the cheek looks tense (D), and the unnatural stretch of skin can be recognized next to the nostril (E). There are three muscles that are contracted at the same time around the mouth area. They usually tighten the lips. 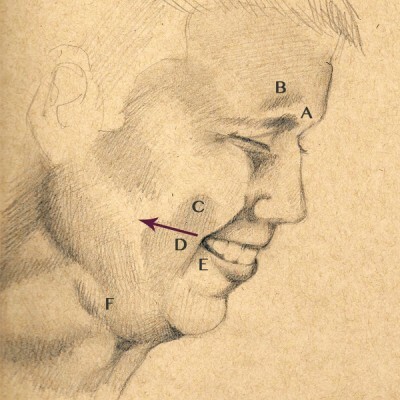 The Risorius pulls the lips to the side (F), the Depressor Anguli Oris pulls down the corner of the lips (G), and the Mentalis pushes up the middle of lower lip to create a bumpy hump on the chin (H). The man’s face would be even more sad if the corner of his lips were completely turned down. The next video is about a bus driver who receives a surprise flash mob on his birthday while he is at his work. He seems very confused at first, but soon he figures out the situation. He shows a beautiful smile with warm tears on his face at the end. Even though I don’t speak Danish, I understand exactly what is happening. This video reminds me that we don’t need a wall of language to communicate each other’s feelings! Let’s see his eye area. His eyes became slightly thinner, and his lower eyelids have a bulge (A), which means that he is smiling. 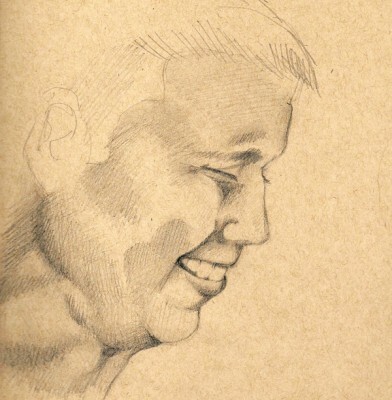 His cheeks are round and it almost seems like the Zygomaticus Major has been contracted (B), but it is actually different from the natural roundness of a pure smile. This means that only the upper half of the Zygomaticus Major has contracted in his face. 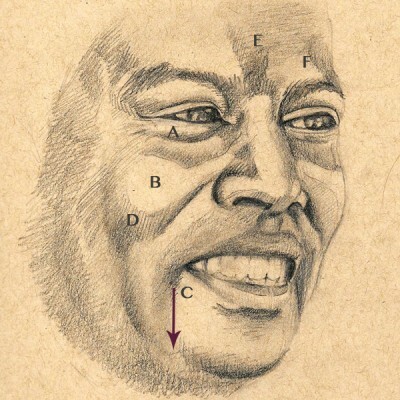 We can see that the Depressor Anguli Oris is pulling down the corner of the lips (C) and the lower cheeks have a shadow that indicates a sharp turn of form (D). There are many contractions created on his forehead that we do not normally see on a pure, happy face. There is a small wrinkle in between his brows (E), and we can see some random dents above his brows (F). It looks like he is holding his emotions back, and might start to cry at anytime. The last video I would like to sample is a surprise announcement from a wife to her husband. In a photo booth, she told him that she was pregnant, by holding up a sign that says “Baby”. This revelation caused the husband to cry “happy tears”. It is hard to judge if he is smiling or crying because we only see his profile for most of the time. Although, there are some points that prove his true “weeping of joy”. The first thing to focus on in his face is the shape of brows. We can see that the center of the brows is slightly pulled up (A). 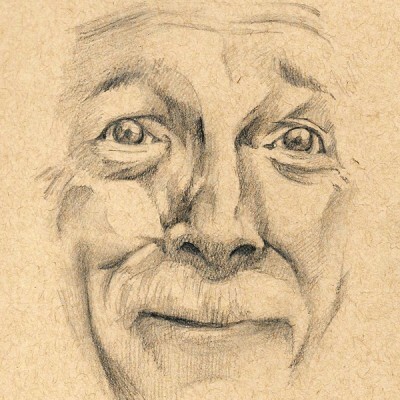 When drawing this expression, you can add some shading here to create the distorted brows even more (B). We can also see the contraction of the Zygomaticus Minor on his cheek. The cheek has a large shadow and dent along side of the nostril to the chin can be recognized(C). This only appears when the sadness muscle is contracted. Now, let’s look at his lips, which appear to be smiling. This form is very close to the pure, smiley lips; but the difference is that the corner of the lips are yanked very tightly, as if they are hidden behind the cheek (D). Also, we can see a very small gap between his lower lip and upper teeth (E). These are recognizable because the Risorius and Depressor Anguli Oris pull the corner of his lips downward and to the side at the same time. When people have a natural smile, only the upper teeth are shown. The most recognizable feature of “Weeping of joy” from the profile is on the neck. When people sob, the skin of the neck gets tense and starts shaking. Also, the sheet-thin muscle that is attached from the neck to the bottom of the chin creates unevenness, and shows an unusual dent (F).